The libero who helped his team earn its first postseason victory as a NCAA Division I-II program is now adding a college men’s volleyball national honor to his senior season. 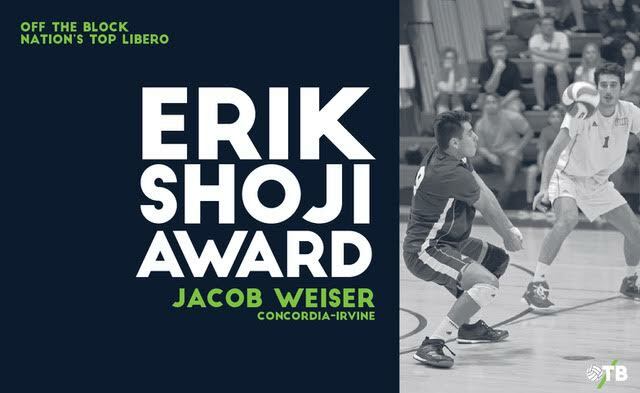 Off the Block announced Friday that a nationwide voting committee selected Concordia-Irvine libero Jacob Weiser as the 2018 recipient of the Erik Shoji Award. The Erik Shoji Award, which is named after the former Stanford All-American and current U.S. starting libero, is presented to the nation’s best libero in NCAA Division I-II men’s volleyball during the regular season. Weiser finished the season leading the MPSF and was fourth in the nation with a 2.77 digs per game average. The all-conference senior also was third in the nation at 296 digs — 74 more digs than other player in the MPSF. Weiser had double-digit digs in 18 regular season matches as Concordia-Irvine finished in fourth place in the MPSF and swept Grand Canyon in the conference tournament quarterfinals. The Eagles opened their inaugural season in the MPSF unanimously projected in the conference preseason poll to finish in last place. A voting committee of about 25 men’s volleyball coaches and volleyball media members from around the nation determined the winner of the Erik Shoji Award. The top three vote-getters were named finalists for the award. Weiser earned 27 votes to finish 13 votes ahead of the runner-up Hawai’i libero Larry Tuileta. The other finalist George Mason libero Johnny Gomez ended in third place with 11 votes. This is the third year that Off the Block has presented the Erik Shoji Award. Previous winners of the award are Stanford libero Evan Enriques in 2016 and former Long Beach State All-American libero Andrew Sato in 2017. Te Erik Shoji Award is one of several annual end of season awards presented by Off the Block. Among the other national awards includes the Lloy Ball Award to the nation’s top setter, the Bryan Ivie Award to the nation’s top opposite, the Karch Kiraly Award to the nation’s top outside attacker and the Ryan Millar Award to the nation’s top middle attacker.